Ever lived in the tropics? Even been there during the rainy season? Well, it’s not the rain that gets me (I live on a mountain so flooding isn’t a problem). It’s the inescapable dampness that permeates everything. There are parts of my cement floor that haven’t looked dry since the first rain. I had to put my opened pack of gum in a ziplock bag…because the air turns the sticks of gum into a sticky, mushing goo. Every leather item in my house—wallet, belt, bracelet—I regulated to a ziplock bag. Even though I stored those items well off the floor and in the driest places in my house, a nice blue-green film grew on them. My wooden cooking utensil are now spotted with mold from just waiting to be used. Washing clothes is a bear because the clothes won’t dry on the line. And despite my diligence, a small crop of mold started to form in my wardrobe. I had to wash about three quarters of my clothes as salvation from the infectious growth and certain squalor. It’s between 60 and 75 degrees Fahrenheit and it feels like the pits of winter (and technically is here). It’s partly the breeze that cuts through my uninsulated house without shame that makes mild temperatures seem frigid, but it’s mostly because in the shade the dankness is finger-numbing. Of course, winter only lasts a couple months. I have grapefruits, oranges, and mandarines sitting on trees, ripe and ready for picking, whenever I need a vitamin C boost. The sweatpants, knitted socks, sleeping bag, and heavy comforter that seem outlandish in the thick of summer are my key to survival when bedtimes comes these days. Bedtime comes hours early and wake up time comes hours late. It’s just too dark or too cold to function at optimal rates. Community member: Do you have a boyfriend? Community member: But you’re pretty. Community member: When are you going to have kids? Me: I don’t want to have kids. Community member: Give me your eyes. Community member: I want your eyes. Community member: Have you gained weight? Me: No, I’m the same as I was. Community member: You’ve gained weight. Community member: In your country? Community member: How about a Paraguayan? Community member: What is your religion? Me: I don’t practice religion. Community member: But you’re Christian, right? Me: I don’t have a religion. 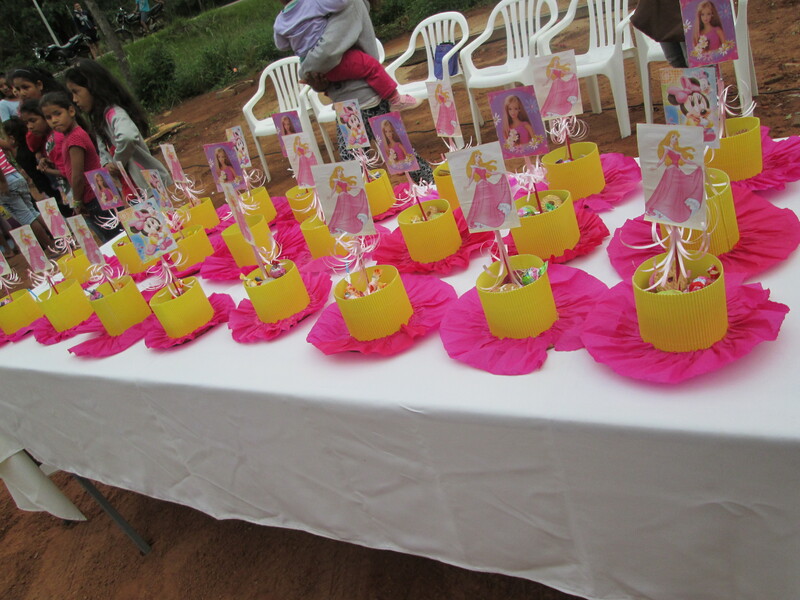 In early May, Paraguay celebrates Teacher’s Day, and it’s no small thing. In fact, in an almost ironic way, schools have the day off. The school where I work also got the day before off—because we held a celebration for teachers. 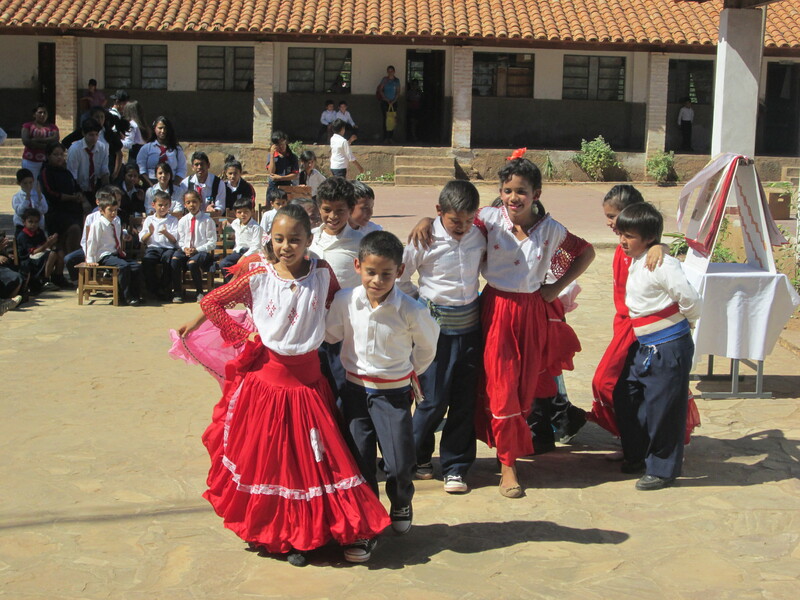 In the morning of the celebration, students performed skits, dances, and poems. The school recognized one teacher who retired last year after 30 years of teaching. Then, there was a lunch for all the teachers. 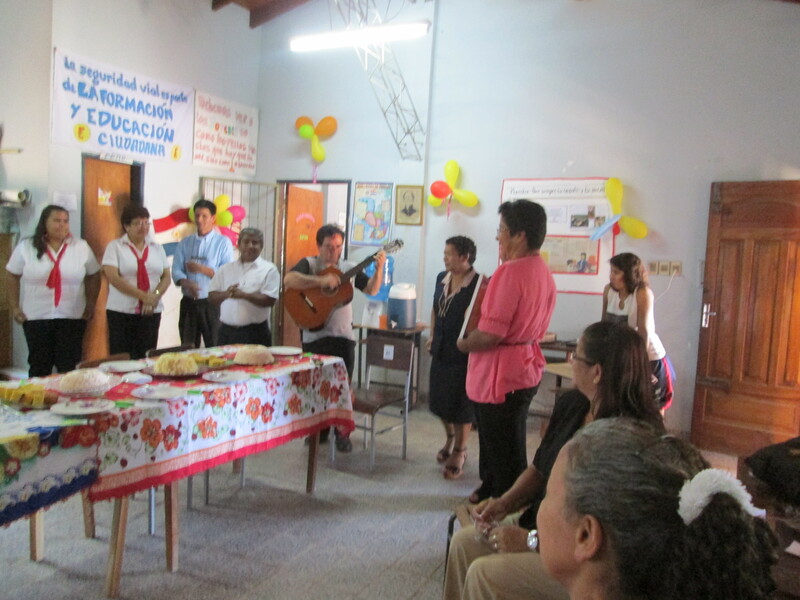 We had cake, danced a little, and sang traditional Paraguayan songs. When my school invited me to participate in the teacher’s lunch not as a special guest but as a teacher it hit me: I am a teacher. I never thought I’d be a teacher. There were brief moments in high school when teaching, the profession, crossed my mind. My Peace Corps projects have brought me back to high school (I teach grades 8-12 primarily). My days, in Paraguay, are filled with life skills classes, English tutoring, and sometimes helping with communications class (Yes, I am helping with Spanish homework even though my students make fun of me for my errors in Spanish when I speak. It stems from the fact that I’m good at literary analysis, and that’s a challenge for many in my community). Even if my role as a teacher wasn’t formalized by my work in the school, I still think my main project in Paraguay would be teaching. Whether I mean to or not, I push the people I interact with in my community to expand. First, they have to put in a good effort to understand me—which is not just a lesson in active listening, but also clear communication. Second, and more profound, we have different cultures and understandings of the world, and together we are helping each other grow. It is easy to forget or demean the importance of exposure to people different from yourself in the grand scheme of life and Peace Corps service. But, in the end, that’s the core of it. Peace Corps volunteers do a range of work that can be reported—lectures, classes, building things, camps—but in the end the only sure things that change are the volunteers and the people with whom they spend the most time in their community. I can’t summarize personal growth neatly in a report. But, many things that are worthwhile are hard to quantify—love, friendship, goodness, happiness, kindness, respect—that’s what makes life so damn exciting. My grandfather was a veteran. That has many layers of meaning to those born in the USA. For me it invokes conflicting thoughts. But, in Paraguay the understanding of the military is different. I do not know how the history of the dictatorship or the history of several high-casualty wars influence Paraguayans’ views of Paraguayan soldiers. I know soldiers are respected here. But, from what I understand (grain of salt) joining the military is held high in Paraguay because it’s a good, solid job. One has to work hard to get in, and once he or she is in he or she will always be able to provide for his or her family. In Paraguay, the military is a providers’ choice. Paraguay doesn’t wage wars these days like the States still does. Paraguay has never been charged by scholars as trying to be the “world’s policeman.” In Paraguay, the military is a secure way to pull oneself up his or her bootstraps. Paraguayan soldiers have a small chance of being shipped off to a land they don’t know to fight a guerrilla war. In the current political climate, they seem unlikely to use their weapons on any kind of battlefield. Several of the most difficult conversations I’ve had in Paraguay were about military service. 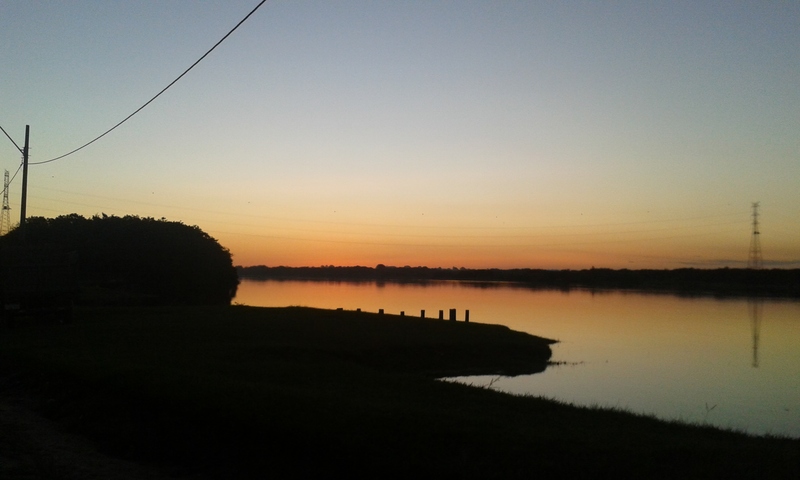 I’m close to the family of a young man who is studying in the Paraguayan military academy. His sister once asked me if I like soldiers. His aunt talked about what a hard-working person the soldier-to-be is. His mother and father explained how they’ve had to sacrifice to send him to military school. They hope he will help his younger sister when it’s her turn to go to college. During those conversations, I thought of Arlington cemetery and the news—why I don’t like watching the news. I thought of the base shootings. I thought of the pledge of allegiance. I thought of baseball games and the National Symphony Orchestra’s concert each Memorial Day on the Capitol lawn. I thought of my grandfather in uniform. I thought of the star spangled banner. In those conversations with Paraguayans about the military I chose to listen. I chose to limit my commentary. There are cultural things that can be explained—food, for example. There are parts of culture that run too deep to neatly fit in words. What do Paraguayans think when I tell them my grandfather was a soldier? How would they react to his funeral? Do Paraguayan soldiers have special burial rites? If so, who gets them and under what circumstances? Are Paraguayan mothers worried about their children or just proud when they enlist? “He was honored and not forgotten,” my father said of my grandfather’s funeral. My grandfather was a soldier for 20 years. He fought in WWII and Korea. He suffered for it. But, his comrades remembered him and in doing so they helped bring some peace to his family. Shiny pins and folded flags don’t pay for the dead, but ceremony does help those who are left behind. It’s easy to forget. To close the door when the job is “done.” But, being able to talk to my father the week of his father’s funeral and hear the pride in his voice for how my grandfather was sent off—I’m glad that someone, many, took the time to remember. My grandfather lost a lot of himself in those 20 years. But, I will not criticize his motivation. His sacrifice was founded in a dedication to country and all people, a desire to do good. Further, I will not criticize the loyalty of his fellow veterans. In Paraguay, people pray for nine days when someone dies. Each day friends and family are invited to pray and eat snacks. On the last day, there are many snacks and there is extra praying. People remember their dead on specific anniversaries thereafter by holding similar praying sessions. Typical girl birthday party table center pieces/guest gifts. They could look at me funny. Maybe they won’t understand me. Maybe they’ll be mean…they could lie. I wouldn’t want to make them uncomfortable. What should I say? How should I start? Why don’t you just go and buy it? Oh, it’s not the money. I’m good at saving. So exhausting, the thought of shopping. How many people will I have to talk to? Are the prices on the items? What…I have to ask? Is the salesperson going to follow me around? Will I be able to try it on? Privately. What are the dressing rooms like? but I’m not sure which is worse. How do I say I don’t want to buy it? Is it weird that I need time to think? Don’t be lame, parties are fun. Yes, but where to begin. How many people do I have to talk to? Should I say “hi” to everyone? Does that mean they were bored? Fun, yes, but exhausting. Every word, enervating. It’s all about who you know. Your network. What does “know” mean exactly? So, like, do I invite them out to coffee? Do I just follow up with a note? How often should I talk to them? Or that they thought I was boring. If they don’t remember me, does that mean I’m forgettable? As something more than an acquaintance? They are so busy. They’ve made that clear. I was worried I wouldn’t have time to recover. What to say or if you wanted me there. I was worried it was just a polite invite. But, not a heartfelt one. I should be more confidant. Then there’s all the smiling. I didn’t know that was happening in your life. It’s science. A hard truth. Reality. The day I felt most successful in Paraguay was the day I fixed my sink, fixed my toilet, taught 5 hours, and then tutored someone in English. But, it wasn’t the teaching or tutoring that made me feel like a champion. There is something incomparably gratifying about fixing things all on my own. A simple joy derived from working with my hands on tangible things stems from my roots. My father is a carpenter, furniture maker, set builder, scenic designer, and general jack-of-all-trades when it comes to buildings things (petty much any medium). My mother is an artist (painter and sculptor) whose dabbles (and dives) into costume design, house building, furniture making, and set design. My stepfather is a furniture maker who also builds houses, fixes just about anything, goes logging with his horse, and changes his truck’s oil on his own. My stepmother, she’ll try to tell you she’s not crafty, but she knits, draws, and knows more about remodelling than she lets on. A lot of what I do in the Peace Corps is intangible. I teach life skills. I teach English. I talk about health theoretically and US culture. I try to set an example for all the young women who cross my path. But, aside from the occasional breakthrough—like when one of my youth answers a question with an answer so profound it makes me pause or one of my students strings together a good sentence or two in English—I don’t see results. On the flip side, when I fixed my sink and toilet I instantly saw my success. One minute my sink was clogged—so obviously I took it apart and in doing so discovered a critical screw was stripped (from years of abuse) and I couldn’t put it back together—hours later it was functioning better than it had before I tampered with it. As for my toilet, the connection between the pipe that brings clean water into the toilet every time I flush and the toilet itself was demolished. Every time I flushed there was a jet of water. The water was only clean, which was nice. A trip to the hardware stone, lots of explaining and acting out what I needed, and I came home with all I needed to fix everything. Whoop! Done. Master carpenter right here, in the middle of Paraguay! Take that Mr. Machismo. I can get all fancy with my talk of and work in social marketing, behavior change, and capacity building, but it will always come back to the same thing. The day I changed the lock on my door with just a knife I was ecstatic. The day I fixed my sink and toilet, I could have taken on anything. I can fly as far away as I want, but I won’t forget my roots. Not for nothing.